The daily challenges of transporting various products was a big factor in the customer deciding to go down the Luton Box Conversion route. 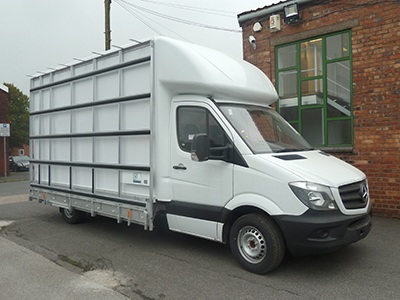 They needed flexibility to transport the variety of products they carry on a day to day basis, which include bi folds, windows, doors and glass. 4 x system 1 poles. Front and rear removable safety marker boards. 2 x full length racks. Body deck floor to the load area. 8 x poles with sponge blocks and straps.